The aircraft carrying the 66-year-old news anchor hit a lorry on a ring road on Monday morning. The pilot is also thought to have died. Breaking the news live on TV, a colleague said it was “a very sad moment for Brazilian journalism”. He was travelling from Campinas, near São Paulo, when the helicopter came down on the motorway at 12:14 local time (14:14 GMT). The driver of the lorry was rescued by paramedics. Writing on social media, fellow journalists described Boechat as “a journalist’s journalist”, praising his down-to-earth approach and “impactful” reporting. Others said his death was not just a loss for Band, but for Brazilian journalism. Band’s radio network also tweeted the news, saying that staff felt “profound sadness”. Ricardo Boechat gained prominence by making extremely critical and ironic remarks about politicians, while using colloquial language and good humour – a rare stance in an environment still marked by formalities and a deference to the authorities. After working for some of Brazil’s main newspapers and winning several awards, he found his calling as a TV and radio presenter, where he won a large audience. He was cherished by his colleagues, having twice been voted Brazil’s most admired journalist in surveys among the country’s reporters. 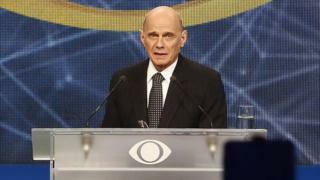 In 2015, he engaged in a fierce debate with the powerful evangelical pastor, Silas Malafaia, one of the most influential religious leaders in the country and an ally of President Jair Bolsonaro. Boechat was also known for his tough stance on the Workers’ Party (PT), after corruption scandals erupted in the governments of presidents Luiz Inácio Lula da Silva and Dilma Rousseff. Boechat started working as a journalist in the 1970s, beginning his career as a reporter in Rio de Janeiro for the newspaper Diario de Noticias. Throughout his accomplished career he wrote for a number of well-known Brazilian newspapers, before joining Band as an anchor.